Pregnancy is a different experience for every woman; while some women cruise through the nine months, others come across miserable signs and symptoms. One of the most common yet troublesome aspects of pregnancy is morning sickness, which refers to the bouts of nausea and vomiting that a pregnant woman usually experiences during the first trimester. Almost half of the pregnant women are affected by the symptoms. The condition is so called because its symptoms are more severe during the early hours but subside gradually during the day, although some women may have them all day long. Though it is nothing serious, it can make a woman really uncomfortable. At the same time, managing morning sickness is easy, with simple lifestyle changes and home remedies being adequate for some and medical help warranted for more severe cases. Though the exact cause of morning sickness has not been established yet, the symptoms can be attributed to pregnancy related hormonal changes in the body; specifically speaking, the estrogen levels increase when a woman becomes pregnant, leading to nausea and vomiting. She may also get nauseous because of aversions to certain odors and foods as well as decrease in blood sugar counts. Most of the time, morning sickness is confined to the first trimester and is relieved naturally as the pregnancy progresses but some women may have it throughout. Hyperemesis Gravidarum is an extreme form of morning sickness, when a woman suffers from severe nausea and vomiting which have serious implications such as electrolyte disturbance and weight loss. Headaches, decreased urination, food aversions, fatigue, fainting spells, anxiety and low blood pressure may be some other symptoms of hyperemesis gravidarum. The doctor may recommend dietary changes, rest and antacid treatment for the condition; in some cases, even hospitalization may be needed for administration of IV fluids to restore the electrolyte balance in the patient’s body. Pregnancy is a delicate phase when a woman should not take any medication without consulting her gynecologist first. Pregnancy-induced nausea and vomiting should also be treated with safe and effective measures. The doctor may recommend antihistamines such as doxylamine for relieving these symptoms. These can be combined with vitamin B6 for increasing their efficacy. Changing dietary habits is the best way to curb morning sickness. A woman should avoid the foods and smells that repel her. Eating small but frequent meals also helps as it ensures that she is neither too full nor too hungry. She should get out of the bed every morning only after having a light and nutritious snack, such as crackers or dry cereal. Heavy and oily foods which are hard to digest should be avoided altogether. Hydration is the key for managing morning sickness; therefore a woman should drink plenty of water and healthy fluids such as fresh juice, ginger tea and broth. It is important not to drink water with meals but some time before or after. Ginger tea is revered as one of the best home treatments for morning sickness as it not only keeps the woman hydrated but also prevents nausea. Taking plenty of rest is another effective measure for alleviating morning sickness. Sleeping early is a good idea and those who can take midday naps should do so, though lying down immediately after the meals is not suggested. A woman should be physically active and make mild exercise a part of her daily routine. Some women can benefit from acupressure as it relieves the sick feeling by working on certain pressure points on the body. Those taking iron supplements should consider talking to the specialist about the dosage as these supplements have been known to cause nausea. Though morning sickness can be easily managed with these measures, women encountering more serious symptoms should look for medical help. Excessive vomiting can lead to dehydration, which can have grave implications for the mother and the baby. Timely and proper treatment is what is required to ensure smooth pregnancy in such cases. 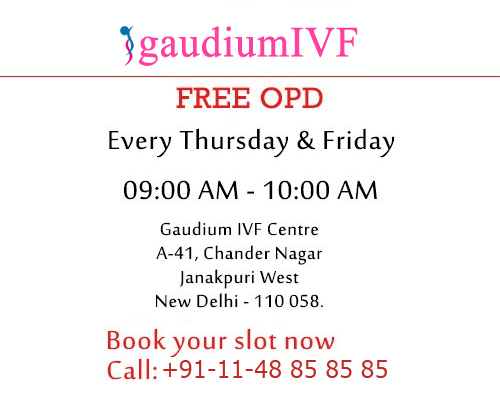 Gaudium IVF is one of the top IVF clinics in India and is renowned for offering advanced treatment and care for female infertility. It also provides effective gynecological solutions for all pregnancy related problems and symptoms. For a free second opinion and expert advice from the leading infertility specialist Dr Manika Khanna, contact today.